1. 7 Reasons Why GOLD Remains the BUY of a Generation! 8. Retirement Nest Egg: Next Gov’t Grab? 7 Reasons Why GOLD Remains the BUY of a Generation! Although we live in an era of instant information and communication; true wisdom, perspective and insight have never been more scarce. Recent gold news headlines again declaring gold is "dead" ranged from absurd to laughable to downright foolish. As the physical gold dust settles following the largest gold price correction in more than a generation, I am reminded of Proverbs 16:16, "How much better to get wisdom than gold, to get insight rather than silver!" Today's news media lacks both wisdom and insight on the subject of gold. The truth is, the world's financial system and central banks have a love-hate relationship with gold. It loves the fact that gold is a trustworthy barometer of the true global financial condition, but hates the fact that gold also reveals the great failure and deception of modern political/economic theory and strategy. Today I am happy to report gold buying is alive and well! I am proud of Swiss America clients who ran to the phone to place 'buy' orders, rather than listening to media pundits advising them to run for the exits to 'sell'! It warms my heart to see wisdom in action. That some Americans understand sound money follows sound fundamentals and owning gold follows financial wisdom. Below are 7 reasons why physical gold and silver coins remain the buy of a generation, as I have said they would be decades ago. For three decades Swiss America has taught Americans to think of their gold as wealth insurance, rather than a perpetual growth asset. The last decade has seen a transformation in the public awareness of gold ownership from “dead” to the strongest currency on earth. No wonder the expectation for gold is continued price increases. But as Jim Rogers reminds us every asset, including gold, needs healthy corrections more often than we have seen. Smart wealth insurance buyers seek the lowest premiums (not the highest) for the best coverage. 2. Ignore Mass Media Experts, They Have Been Wrong for a Decade! “Expert” gold bears called the bull market dead after last Friday’s 5% decline, sending gold into “Bear market” territory with a total decline of 22% from the 2011 high of $1,891. Then came Monday, with speculators capitulating to margin calls, sell-orders cascaded and gold prices dipped another 7%, resulting in the biggest 2-day sell off since the 1980s. My response: Big deal! A 25-30% gold price correction back to the $1,325-$1,425 level is a gift for those who have felt priced out of the market. Truth is, this is one of the best buying opportunity of the 21st century! The fundamentals for gold are as solid as ever. Currency wars, unsustainable debt in the U.S. and abroad, stagnate economic and wage growth, distrust of politicians at near epidemic levels and the endless list of failed economic policy. Since 2001 all roads began to lead to gold, unless you really think debt will shrink, the budget will balance, the Fed will stop printing, the dollar will gain value and politicians will stop spending us into oblivion. Here are 20 reasons to be bullish on gold that we outlined in 2006. They remain the same today. 3. Profit potential: Gold prices will likely eventually reach well above $2,000/oz. Over the last 5 years the U.S. economy has become a debt bubble searching for a pin(head). It may happen this year, or within the next few years, no one knows for sure. Meanwhile the U.S. will gradually stagnate at best, stagflate or hyperinflate at worst – taking the buying power of Americans savings – and our global reserve currency credit card down with it. Just as Roman, Athenian, Ottoman, British and Spanish reserve currencies all have fallen before, as explained in our recent books. When a storm hits at sea there are two classes of people: passengers and the captains/crew. One class runs downstairs, gets sick and hopes the boat will somehow make it back to a safe harbor. They complain, tell everyone to hurry up, are uncomfortable and they wish to be home. Meanwhile, the captain and crew man the sails, hold the rudder and stay the course. These brave souls will not allow someone else to be responsible for their safety and that of their family. They arrive home safe because they never lost sight of the harbor. Down below is nothing but misery. Up on deck the harbor is in clear sight despite the howling wind and stormy seas. Fearful passengers can only see the troughs and peaks from wave to wave. But the captain and crew see the bigger picture – which also leads the way home safely from the perfect storm. As Chairman of Swiss America I am leading by example and buying this gold price dip because I know that gold’s 3,000 year old track record of preserving wealth is untarnished – unlike almost every other wealth preserver on earth. Wall Street speculators have no wisdom when it comes to owning PHYSICAL gold – they never have and never will. Instead they love paper money, credit and debt. Meanwhile, watch as big and small money quietly begins to pour back into buying physical gold. Let speculators in PAPER gold sell off their Gold ETFs. In the long run smart investors will be rewarded with the benefits of cost-dollar-averaging their gold portfolio in their own favor. Central Banks in China and India are already scooping up tons of gold at record levels. And in the process they can thank weak-handed speculators and would-be manipulators – and so should every wise long-term gold buyer. 7. "Everybody Wants to Get to Heaven, But Nobody Wants to Die." This truism can also be applied to investment wisdom. Everybody knows the smart thing is to "Buy low and sell high." But when a precious commodity and emerging global currency such as gold dips low, most people become afraid to buy it. Why? Because nobody wants to die. The birth of an investment vision often requires periodic re-vision (read: correction) to stay on course to reach the correct destination. This requires the courage of our convictions, proper analysis of the fundamentals and the patience of our principles. Those afraid to buy low will spend their lives buying high from others - and never achieve financial independence and freedom. Learn from history of the last decade, learn the wisdom of buying gold right now! If not gold, then what other investment over the long run is better and safer? Your money is going to be "invested" in something, even if you hold it as paper dollars stuffed into your mattress. Your paper dollars are constantly devalued by the Fed's (QE) endless money printing. Inflation will result. Everyday goods prices soared in February at an annualized rate above 25%, yet the world's 'wise men' see no inflation threat. The investors' dilemma is to sit in a bank at negative returns or enter the stock market casino near an all time high. Following pack-mentality fundamentals and principles is complete foolishness. Stocks are high because the market is intoxicated and addicted to Fed stimulus money. The market's levitation is a magician's conjuring trick, an unreal mirage. When the Fed cuts off its economy-distorting drug (printing money) stocks could drop dramatically. But if the Fed keeps injecting ever-larger doses of money conjured from thin air, then the U.S. Dollar could soon die from an inflation overdose. Either way, this is going to end badly. Both paths lead to fiscal disaster or even depression. Gold remains the sober investment of choice, with a 3,000 year track record as a safe haven of value when nations collapse and paper currencies burn. Can you and your family afford to gamble your savings and future by investing in anything riskier and less secure than gold, especially in today's insecure world? A portion of physical gold provides the ultimate wealth insurance. Today may be your lucky day! Those intoxicated on stimulus money sold their gold cheaply. Their loss could become your gain. Those who sold gold in a panic provide us an amazing opportunity. Let's seize it now! In my most recent article (March 1, 2013), I wrote "The Ultimate Precious Metals test is here. You believe or be prepared to panic." I have broken down on all of the “technical” models I have used for decades. They indicate we are heading down perhaps sharply as low as $1250.00 in gold and $20.00 in silver. Support levels in the nearer term for Gold are at $1525.00, $1425.00 then $1250.00, perhaps by as early as June as outflows could be rapid due to margin calls on highly leveraged futures market positions, these leveraged positions can create immense volatility. The answer in my humble opinion to all of the above is false. What you are now being offered is a huge discount on wealth insurance. That ugly duckling that everyone is kicking to the curb will now blossom into a beautiful swan. 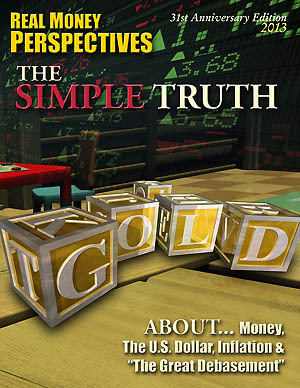 That's right Gold is now on sale but it is an ugly duckling according to the media and pundits. But if you clear your mind and look at the real facts you will see that a beautiful swan will emerge. 1. The dollar is the ugly duckling and many of us are coveting it, hoarding it and being forced to liquidate everything else because the perception is nothing can be trusted. This could be a detrimental move! The BRICS want nothing to do with it and many more countries no longer want to trade in U.S. dollars so why should U.S. Citizens be coveting a currency that many are preparing to abandon? 2. The economy is not healthy. I don't need to expand on this too much, look around you, talk to your neighbors, look at your city, state and be aware. 4. 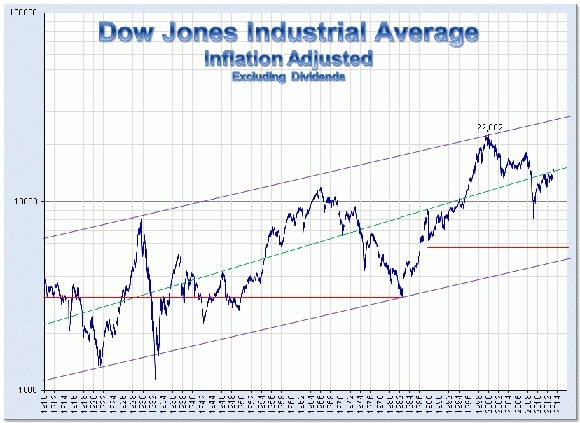 True, the stock market has rebounded but when adjusted for inflation it is well below the levels of 2000 and upon careful examination looks very similar to the Dow of the 70's. In fact we appear to be at about 1973 levels, right before the real bloodbath. So be cautious. 5. I don't trust banks very much right now. If you look at the big bank ratings services you would realize how close your bank is to the edge of a cliff, the majority are teetering and having to get free money from the Fed to survive. That doesn't give me the warm and fuzzies. The truth is, all banks, all around the world, are bankrupt, and have been for years. That's because all of the world's banks run on a fractional reserve basis. Look it up; do your research. 6. QE isn't effecting the value of the dollar yet but look again at this graph from the Federal Reserve and explain to me please how this monetary expansion won't lead to a eventual collapse in the dollar's buying power. The lag between cause and effect is your friend and you can protect yourself from the consequences that lie ahead. 7. The 10 and 30 year Bond yields are the lowest they have ever been. Yet people own them for "safety". I contend that this is the real bubble, perhaps the biggest bubble we will ever witness. When rates begin to rise, the exodus will be swift and the Fed may not be able to print money fast enough to save it. They have been buying back there own debt for years. They must get confidence going in the economy or they implode along with the bond market. QE to infinity appears to be the only Fed solution. Pay no attention to the man behind the curtain. 8. Cough, cough. Savings rate? What is that? Retirees are in trouble if they depend on banks for yield, even with the reported current low inflation rate they are losing badly as are all savers. 9. We appear closer to another conflict than ever. Iran, North Korea, etc ... need I say more. The big war is the currency war and the U.S. wants to win this war at all costs and as always there are casualties to war. In this case it will be YOU and me if we trust in U.S. Dollars, Bonds, Bills, CDs and Stocks. So what do we do now that gold is no longer a great buy? Or is it? 10. Gold. Central banks are buying every opportunity they get, entire Countries are loving this price decline. If you own gold in any form other than physical metal you more than likely currently hate gold. As a physical owner I don't like what happened, or should I? Gold has NO debts and No liabilities attached to it. This, upon careful examination, appears to be the best buy since the 2008 collapse. 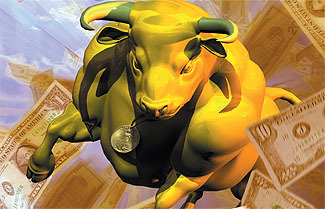 We had a huge 30% decline in 2008 from $1,000.00 to $700.00, the media screamed gold's bull market was over. They cried that it wasn't a safe haven after all. Sound familiar? I argue that this only put gold back on a better plane at a much more healthy angle of ascent. If you understand that options are limited, that the stock market is looking like it did in 1972, that we can't save and keep up with the cost of living, that bonds are a bubble, that soon nobody but us will want U.S. Dollars, that we are in a currency war designed as a race to devalue our currency and that banks are bankrupt just like the United States ... you will see this as I do. A MASSIVE OPPORTUNITY to buy wealth insurance at the lowest premium in years. I believe, as in 2008, we are now in a position to potentially see gold better than double from current levels, as it did after 2008. We just finished attending the 2013 Barrett-Jackson collector car auction. Every year (and this is their 42nd year) they bring to Scottsdale some of the finest premier collector antique cars from all over the world for auction. It is worth the price of admission just to walk around and see what our fathers, grandfathers and great grandfathers could have driven. Antique cars from the early 1900's to one-of-a-kind custom cars. One car that caught the attention of all the attendees including ours, was a 1949 Delahaye type 175 Saoutchik Coupe De Ville. Talk about an eye-catching, over-the-top custom classic … this was it! This magnificent Saoutchik bodied Delahaye was a stunning example of the decadence of the famed French coach-built cars. The Saoutchik and Delahaye team were a combination of French style and performance. Emile Delahaye was one of the first French car builders. Cabinetmaker and aerodynamicist Jacques Saoutchik began his career building automotive bodies. They catered to the wealthy. And if you were wealthy and wanted to be noticed … you went to these guys to have a car built for you! This elegant vehicle was built specifically for the Paris Auto Salon Show in 1949. It was a sensation! A flamboyant, tapered teardrop design was accented by handmade chrome sweep spears and subtle two tone paint. It took over a year to build. This car has some amazing details. Inside this car, the interior fixtures are all plated in 14-karat gold. It also features a removable panel above the driver's compartment. The carpet is deep, plush lambswool and the doors are opened by a push-button. The headliner is cloth and the interior panels have a treatment that would more likely be found in an Art Deco palace than in an automobile. There is a Motorola radio, clock and OS gauges. The first owner was Jack Pry of Washington, D.C., one of the nation's largest foreign-car dealers at the time. He purchased the car for $20,000, which was an extraordinary amount of money in the late 1940's making it one of the most expensive vehicles of its day. Another way to put the cost in perspective; it took over 570 one ounce gold coins to buy this car in 1949! The lucky bidder at Barrett-Jackson paid $1,100,000 (plus a 10% buyer's fee) for this treasure. And guess what? In 2013 it still took just a little over 570 gold one ounce coins to buy it! It took the same amount of gold to buy this car new in 1949 as it did last week, 65 years later. How can this be? The original $20,000 in 1949 paper dollars would barely purchase a vehicle today, much less one of the world's finest luxury automobiles. As much as this makes for a great narrative it carries a very powerful parallel in each of our everyday 2013 lives. This same dynamic exists in our ever increasing cost of living and will have a profound effect on our financial future. Call Swiss America today to find out how to make your money spend the same year after year, no matter what our government does to manipulate our currency. “Contentment comes not so much from great wealth as from few wants.”- Epictetus, 108 A.D.
Thoreau wrote, "As you simplify your life the laws of the universe will be simpler, solitude will not be solitude, poverty will not be poverty, nor weakness." The Greek philosopher Epictetus helped his generation understand the balance between seeking wealth and finding contentment, or peace of mind. “Abundance is not the goal, but rather the byproduct of living a gracious life,” taught the late Christian leader and author of Real Men Dr. Edwin Cole. In keeping with our "The Simple Truth" theme for 2013, this year we present "The Simple Portfolio" model. What is a true financial foundation for central banks is also true for individual citizens; physical gold ownership and possession instills confidence, stability and trust during uncertain times like these. Today Americans are losing confidence in the Fed, which has created a casino mentality on Wall St. while prompting an international currency war and falling U.S. dollar in the process. Meanwhile, the number of Americans riding in the wagon grows daily and the load grows heavier for those pulling it. The classic Tennessee Ernie Ford song, "16 Tons" comes to mind. For three decades Swiss America has stuck by the European, or so-called "permanent" portfolio model which suggests up to 25% allocation into tangible assets. Today's typical "60/40 Portfolio" (stocks/bonds) for diversification could be enhanced greatly by adding between 5%-25% of the best asset class of the century: GOLD! Some investors may opt for just 1-2% allocation into gold, which is the current average, but others will decide to convert 25% or more of their paper assets into hard money as they better understand how a tidal wave from "the great debasement" could wipe out debt-based paper assets very quickly. Another popular variation is the "7Twelve Portfolio" which promotes owning 7 core assets classes in funds (eight in stock funds, four in bond funds). But this is only a slight improvement, allotting up to 3% for commodities. The "7Twelve" model provided a 147% return over the last decade in comparison with a 35% to 60% return on the more traditional "60/40 Portfolio" model used by Vanguard and other mutual funds. In comparison Gold prices have risen nearly 500% over the last decade, ANY portfolio would have been enhanced by taking our simple recommendation of adding tangible assets like Gold and Silver. "Over the last 10 years, the 'permanent portfolio' strategy, made popular by libertarian investor Harry Browne several decades ago, has had quite a heyday, earning insane amounts more than any U.S. stock market index. Browne kept the portfolio incredibly simple; 25% stocks, 25% bonds 25% cash and 25% gold,” reports SeekingAlpha.com. 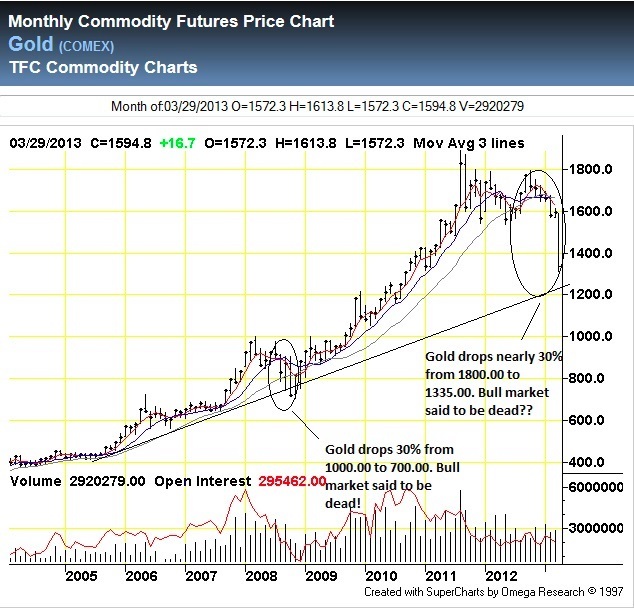 This chart illustrates that over the last twelve years Gold prices have grown 471%. So a $100,000 investment into Gold would have grown the portfolio to $471,000. But the same $100,000 invested into the Dow Index would be up just 21%, for a total portfolio of $121,000. That's not even enough to cover our 6% annual 'real world' inflation! But with just a 25% portfolio diversification into Gold, that same stock portfolio today would be worth $238,000 - nearly double the growth of the stock portfolio. For this reason I believe more and more investors will seek to rebalance their portfolio this year and many millions will turn to Gold and Silver for safety and growth potential in their savings and retirement accounts. Over the last decade precious metals have helped balance portfolios by providing a golden foundation. And over the next five years Gold will be needed to stabilize and keep wealth on a solid footing. 2013 is a great year to begin or continue converting paper assets into real assets. Owning Gold is a simple, permanent portfolio strategy for peace of mind. It's time to learn from the past, live in the present and plan for a golden future. This is how business executive Craig R. Smith and futurist Lowell Ponte describe “The Great Debasement,” a manipulation of the U.S. Dollar that they calculate has since 1913 expropriated more than $222 Trillion from the American people. Because of this deliberate century-long policy of debasing America's money, today's dollar has only 2 pennies of the purchasing power of the 1913 dollar. The 2012 election and 2013 “Fiscal Cliff” of massive tax increases are ominous echoes of what happened exactly 100 years ago, warn Smith and Ponte. The strange 1912 election turned America's government over to Progressives, who in 1913 imposed the Federal Reserve System and the income tax. The 2012 election and 2013 Fiscal Cliff,” they say, could make Progressive rule permanent by turning a majority of voters into government dependents. America's central bank, the Fed, and income tax gave politicians almost-unlimited power to borrow, spend and expand government. The Federal Reserve was explicitly designed to turn the dollar into an “elastic” currency. The income tax forced Americans to accept and use this new ever-more-debased fiat monopoly money to pay their taxes. The 100th Anniversary of this Debasement brings America to a tipping point. We are becoming “a 50-50 nation – half of us paying the taxes, the other half receiving the benefits,” warns Harvard economic historian Niall Ferguson. Today 49.1 percent of households have at least one family member who gets a government benefit. More than 47 percent of adult Americans pay no income tax. Many dependents see government as a free goody-dispensing machine. “When the people find that they can vote themselves money, that will herald the end of the republic,” warned Benjamin Franklin at America's birth. If Progressives win even one branch of government in the 2012 elections, their vision of ever-expanding government could become permanent by creating a voting majority of those dependent on, and addicted to, government money. The Great Debasement created today's upside-down, Alice-in-Wonderland economy in which the stock market goes up on bad news and down on good-- because major investors want whatever causes the Federal Reserve to conjure trillions more Quantitative Easing (QE) stimulus dollars out of thin air. Modern Monetary Theory and neo-Keynesianism behind Fed and Federal policies teach that borrowing another $58,000 every second to fund 40 percent of Federal spending is good, but that people saving their money is bad. These theories teach that the dollar losing value (inflation) is good, but that the dollar gaining value (deflation) is bad. They teach that government should tax ever-more money away from productive business people to redistribute to the unsuccessful, whose faster spending supposedly accelerates economic growth. This book offers vivid, dramatic examples of how today's increasingly-fragile economy could be shattered by a wide range of shocks – a new Middle East war, fuel shortages, high-tech terrorism, prolonged drought, collapse of the Euro, replacement of the weakening dollar as the world's Reserve Currency, or a continuing leftward shift in American politics that dries up investment and jobs in our formerly business-friendly nation. The Great Debasement reveals how the dollar is already a dematerializing “ghost currency” as America follows the excessive spending-and-debt policies that undermined past empires. It shows how both prudent individual choices and restoration of the U.S. Constitution's standard for sound money could redirect our future away from a potential new Dark Age and toward a prosperous new Golden Age. "THE GREAT DEBASEMENT is very reader-friendly. I simply couldn't put the book down once I started reading it! The book should be required reading for all high school students and above." "This book is disturbing. I didn't realize this stuff"
"In THE GREAT DEBASEMENT some of the most interesting subjects were: Karl Marx and Marxism, Hitler and the Third Reich, EMP bombs, Nuclear Holocaust, The Dust Bowl, the Ottoman Empire, the French Revolution and Obama's pursuit of FDR's dreams. I agree that FDR's confiscation of gold and then silver could very well happen again. Most likely, I believe everything your book says. In 2016, the 50/50 national divide will become 60/40 because of the 'Happiness State' defined at the end of your book. The foundations and the dreams will be gone. One goal for debasing the American dollar is just that - to take 'In God We Trust' off of any currency." "I am really enjoying the book a lot better than I am the economy." "It is so curious that this information is not reported in the media. It is surprising that more people do not know what is really going on in Washington." "The Great Debasement is well worth the read"
"Thanks for spreading some real economic knowledge!" "Enlightening and scary... We're screwed!" "THE GREAT DEBASEMENT is very educational...explaining how politicians have used deceptive ways to tax, control and debase our money. It is a shame and crime what has happened to America! I will share this book with others! Keep up the good work! One brush stroke stands for danger; the other for opportunity. Many politicians no longer gain and wield power through reasoned debate and calm compromise – but through the politics of crisis, panic, fear and emergency decrees. To restore the republic, we can and must immunize ourselves against such political manipulation of our minds, money, values and votes. Our first step to escape the emerging crisis-ocracy, which could also be called a “panicracy,” is to understand how it works. For Native Americans of the Western Plains, hunting buffalo with puny arrows was difficult and sometimes deadly to the hunter. Tribes such as the Blackfeet devised an easier, although ecologically destructive, way to kill their prey and obtain a year's worth of meat in mere minutes. As Lewis and Clark described, a swift-footed young brave wearing a buffalo head and hide would move between a grazing herd and a nearby cliff. At a prearranged signal, the hunting band would stand up and rush towards the herd from the opposite sides. As the animals panicked, the young brave who appeared to be a buffalo would start running towards the cliff. Being herd animals, the buffalo would follow him and start to stampede. At the last moment, the brave ducked into a rock shelter. The onrushing frightened buffalos, unable to see the danger or stop, charged over the cliff to their doom. Why do you think that January's panic-driven congressional agreement to authorize $41 in new government spending for every $1 in spending cuts was urgently needed to avoid going over “the fiscal cliff,” which lawmakers and the public were told would be a nightmarish disaster for the economy? This is what being “bullish” means in today's crisis-ocracy – to be buffaloed cattle who are herded and stampeded by others for their benefit. President Barack Obama was elected by precisely such tactics. As Craig R. Smith and I documented in The Inflation Deception: Six Ways Government Tricks Us...and Seven Ways to Stop It! (pages 28-32), weeks before the 2008 presidential election the United States suffered “a financial Pearl Harbor” attack as half a trillion dollars from mysterious overseas sources made a coordinated assault to undermine key U.S. Institutions,including Bear Stearns and Lehman Brothers. Both broke under vicious bear raids. The presidential race was put on hold as senators, including Republican standard-bearer John McCain and his Democratic rival Barack Obama, rushed to Washington, D.C., amid demands that Congress authorize an immense bailout fund to prevent collapse of the nation's largest banks and investment houses. Congress hesitated and then – after days during which no collapse occurred – agreed to authorize nearly a trillion dollars in emergency money for entities lawmakers were told were “too big to fail.” The nation's top bankers were locked in a room until they agreed to accept huge government loans – and the political strings that came with this money. Much of this “urgent” money allocated in the name of emergency would sit idle for months or years, gradually used as a political slush fund to reward crony capitalists and local politicians friendly to the Obama Administration. In this atmosphere of media alarm and uncertainty, the wheels of commerce slowed and the economy slid into recession. A frightened electorate shifted from McCain to Obama, who came to office as head of a one-party state with Democrats also solidly in control of both the House and Senate. President Obama promptly used emergency powers and government money to seize control of General Motors and Chrysler, taking both into bankruptcy to shed their debts. Mr. Obama shoved aside the secured bondholders who by law had first claim on company assets during bankruptcies, then threatened and intimidated those who dared to challenge his high-handed behavior. He then transferred a large share worth $26.5 Billion of the ownership of these companies to the left-liberal United Auto Workers union, a major campaign contributor to Democratic politicians. This was, noted critics, the behavior not of an elected American president but of a caudillo dictator in a Central American banana republic. When the Democrat-controlled U.S. Senate rejected 95-0 a bill giving him the power to regulate carbon dioxide (which we carbon-based human life forms exhale after every breath), President Obama had his Environmental Protection Agency impose such power via regulation. Mr. Obama is the first President ever held in contempt of court for illegally obstructing oil drilling in the Gulf of Mexico in defiance of a court order. He blocked uranium mining on federal land in northern Arizona and attempted unilaterally to shut down coal operations in Appalachia. He directed that 80% of the $90 Billion budgeted for solar and other alternative energy go to companies such as Solyndra whose leadership included major Democratic campaign donors. President Thomas Jefferson once said that “great issues should not be forced on slender majorities.” Obamacare was rammed through using parliamentary gimmickry after a special Massachusetts election had cost Democrats their ruling Senate majority – so socialized medicine was forced onto Americans with no filibuster-proof legislative majority at all. In the House of Representatives, Democratic Speaker Nancy Pelosi forced an Obamacare vote by lawmakers who were given no time to read the final legislation. “You'll have to vote for it to find out what is in it,” Ms. Pelosi haughtily told them. In election year 2012 President Obama refused to negotiate with congressional Republicans over immigration reform. Then, on June 15, he imposed his own version of the DREAM Act by Executive fiat allowing millions of illegal immigrants – including criminals – to remain in the U.S. and obtain work permits. This allowed illegals to take jobs while 23 million American citizens were unemployed or underemployed. This defiance of law won enough Hispanic votes to secure Mr. Obama's re-election. Mr. Obama also issued an Executive directive that allowed state welfare departments to waive the requirement that welfare recipients must seek work. This slapped aside the “Workfare” law signed in 1996 by President Bill Clinton that had reduced welfare rolls by half. This not only encouraged more welfare dependency, but also meant that the unemployment rate would “improve” from above 8% into the high 7% range for the first time during Mr. Obama's presidency. This gimmick did not create a single new job. However, because those who stop looking for work for four weeks are no longer counted as unemployed, this trick allowed Mr. Obama days before the election to claim that his economic policies were succeeding. It was a crisis-ocracy conjured illusion. Between them, the Federal Government and Federal Reserve injected nearly $6 Trillion of stimulus money into the economy. Economists in both institutions expected that this much money – some taxed from achievers, but most conjured by the Fed out of thin air as paper fiat money – was, by the “multiplier” in Keynesian theory, supposed to produce $1.50 in economic stimulus for every $1 redistributed. Instead of creating prosperity, the Fed's stimulus fumble made business people slow down their hiring and investing out of fear that a tidal wave of inflation would inevitably follow. The feared inflation tsunami is coming, because politicians can no more repeal the Law of Supply and Demand than they can repeal the Law of Gravity. Inflation is the price of government creating a mountain of dollars to exchange for the same old basket of goods, and our stagnant 1-2% economic growth is already being eaten up by real inflation that is running around 7%. 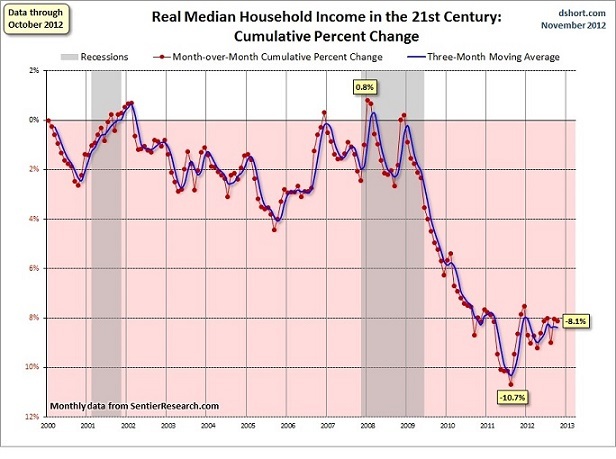 We never left the 2008 Great Recession. The American economy is already devastated by debt now bigger than our $16 Trillion annual Gross Domestic Product (more than 40 percent of which now comes from Federal, state and local government spending, not actual productivity of goods or services). During President Obama's first four years, the Federal Government share of America's GDP rose from 19.5% to approximately 25% as the government grew relative to our economy by 25%. Twice as many Americans are now employed by government as work in all of manufacturing combined. 49.1% of U.S. households now include at least one person who receives a government benefit. Under Mr. Obama we have become a nation in which fewer than half of working-age adults pay income tax, and who therefore are likely to see government as a free goodie-dispensing machine. We have undergone the “fundamental transformation” this former radical community organizer desired, into a European-style welfare state with chronic high unemployment, low productivity, stagnant growth, and therefore an addictive dependence on ever-more wealth redistribution by an ever-growing government. As Craig R. Smith insightfully observes in his 2013 predictions in this publication, our politicians and Fed now find themselves caught in a trap of their own making. Our economy is now addicted to ever-increasing doses of cheap, near-zero-interest stimulus money, yet such spending debases the dollar and will destroy our economy. The politicians need more and more wealth to redistribute to buy their re-elections, but putting heavier taxes on the backs of the productive is already reducing productivity, jobs and economic growth. In the wake of Hurricane Sandy's devastation of New Jersey, we saw President Obama and other politicians promise everything to victims and then deliver almost nothing. What did emerge in January 2013 was a pair of emergency aid packages that added up to $60 Billion. More than half of this amount, said critics, was political pork for special interests that did nothing to help Sandy's victims....but that passed because of their tragedy. Such emergency “Christmas spending trees” used to be the exception for politicians. They are now the norm. The U.S. Senate has refused to pass a new budget for nearly three years because, after Republicans regained control of the House of Representatives in 2010, getting a new budget through Congress would require compromise and cuts in the absurdly-high spending levels enacted during the Democrats' government monopoly of Mr. Obama's first two years as president. The Senate maintains high spending via continuing resolutions, not new budgets as the Constitution requires. Because of Senate lawbreaking and President Obama's unwillingness to reduce the size of government, the only opportunity Republicans have to cut spending comes when a debt limit ceiling is reached, when GOP lawmakers can force Democrats to choose between a partial government shutdown or trimming our obese government down. This has produced a crisis-oriented kind of compromise – brief extensions of the debt ceiling that let wild spending continue, but on a short leash. “The budget is a Doomsday Machine,” said David Stockman, the controversial former Budget Director for President Ronald Reagan. Our current crisis-ocracy thus creates “a new fiscal cliff every few months,” as we become the buffalos stampeded to the edge of each of these cliffs. Living amidst crisis-driven economics and politics is stressful and can produce unanticipated consequences – from heart attacks to mental and social breakdown. While President Obama was using the Newtown shooting tragedy as a crisis to impose gun control, Forbes Magazine columnist Louis Woodhill on January 16 offered three important ideas to reduce the fear that pushes people to acquire more guns. He urged President Obama to stop using crises to circumvent the Constitution, and instead to do more to suppress crime so people will feel safer. Mr. Woodhill's third suggestion showed deep understanding of how government via crisis-ocracy is harming us – and can be reversed: “Stabilize the dollar,” he wrote. “Faced with a dollar subject to the whims of [Fed Chairman] Ben Bernanke and Barack Obama, people will buy more guns,” wrote Woodhill. “Returning to a stable, gold-defined dollar would, among other things, reduce the demand for firearms,” he concluded. Amen. And so, too, would a return to civilized politics and an end to openly ideological class warfare bullying by an imperious president who relishes ruling by decree and intimidation. Because the politicians tax us by debasing our dollars, few are eager to return to the honest, gold-defined dollar that made America great, prosperous and free. So long as we denominate our lives and hold our savings in the form of fiat dollars, we will will render onto Caesar a growing share of our labors and suffer more stress and fear at one cliff after another. We have an alternative. We can create our own personal and family gold standard, our own liberating transformation, by exchanging politicized paper dollars for gold that the politicians cannot debase by running more off a printing press in Washington, D.C.
Gold is the historically-proven way to anchor your savings in solid value, to step back from the cliff and avoid being stampeded by fear that the dollar is about to disintegrate with each new political crisis. Creating a personal gold standard can be your golden key to escape the crisis-ocracy trap, to live with economic security and peace-of-mind, to replace danger with opportunity. SILVER: 2013 IS THE YEAR! Silver has broken out of a major 17 month consolidation to the upside. Anyone who knows me, knows I very rarely talk about or recommend silver. I am not normally a silver buyer because of its volatility. However, in the past 10 years I have noted two major breakouts that have led to massive profits. Combine this buy signal with the fact the Fed is printing massive amounts of U.S. Dollars and that they announced they will continue to hold Interest rates to near zero for at least the next two years, this could be a tremendous opportunity for investors seeking to increase the size of their investment capital and exit a dollar that is being diluted. In the shorter term both gold and silver have become somewhat oversold on the very recent sideways action. Technically, the gap noted in the chart action is very bullish. It is commonly referred to as a breakout gap which is typically followed by a runaway gap then finally an exhaustion gap over time. If you look carefully at the chart data above there are NO gaps in the past decade which leads me to believe this powerful breakout could bring prices near or above $100.00. The time to buy silver has arrived! Are you financially prepared? Gold set to FLY! The monetary policies of this administration led to gold prices better than doubling in four years! We have yet to see the full blown effects of monetizing the debt. How will this affect us? If you are prepared for what is to come you could win big, sadly the majority will just watch their wealth get diluted and panic buy when it is too late. This monetization is great for governments! They can print to forestall bankruptcy of programs like Social Security and to repay its debt. Using history as a guide it very well could lead to higher incomes for the next generation of workers. Remember the 80's saw great income growth but at the extreme expense of double digit inflation in the 70's. If you are retired or nearing retirement this could be devastating as it was to those in the 70's who were caught unprepared. Those who were prepared made fortunes and retired comfortably. Is it time to buy gold now or is it too expensive? As can be seen in its recent 12 year bull market, Gold has experienced only three major breakouts and has had four major consolidations. The strongest breakouts always come directly after long consolidations. The 2004-2005 consolidation was almost 20 months. After the rest it went on to have the strongest percentage gain in the bull market. The other moves were very strong as well. The current consolidation is almost identical to the 2004-2005 consolidation. It is now 17 months in duration and has caused the public to go to sleep as it did in 2005. Take a good look at the data below the price graph in determining if your timing is right for a major purchase, note the volatility on the various time frames using the Bollinger band. Two of the three readings are at eight-year lows the other is at a five-year low. Consider how well you would have done had you timed a major purchase based on this knowledge back in 2005, the last time we were in this position. My target on the next move is between $2,400 and $2,500 which I believe is conservative as it is less than the first two breakouts. Based on the monetary policies of this administration and the Currency war now taking place, the technical and fundamental reasoning for this happening now is in place. Consider these facts. 1. The monetary base has TRIPLED in the past 20 months. 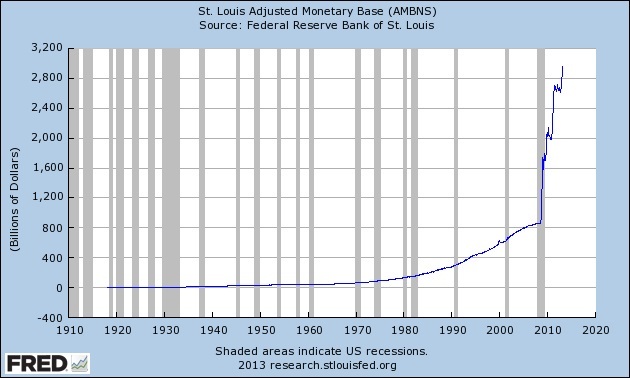 Meaning The Fed has increased our monetary base by three times what was printed in the last 100 years. We have yet to feel the effects, there is a lag between cause and effect! 2. A full blown Currency War between Countries is now in effect. This means Countries are diluting their currencies, thus the value declines in purchasing power. 3. Central Banks worldwide are buying gold. Why? See #2. They are preparing. 4. Gold is a mirror image of the value of our currency. Dollar down, gold up. 5. The technical argument shown above supports that the time to buy is NOW. 6. The fundamentals of currency dilution supports that the time to buy is NOW. The key to the future of Gold is in the fundamentals of rapidly expanding money creation by the Federal Reserve (as can be seen on the graph below). It fully supports gold moving much, much higher. As does the zero interest rate policy they have put in place until at least the end of 2014. There is NO yield to be had folks, our cost of living is sure to rise because they are trying to inflate their way out. But when is the best time to buy? It is never wise to buy or wait until the market is screaming upward and the news media is all aboard. It is time when the fundamentals are intact and the media begins to jump on the negativity bandwagon. The insanity above should absolutely scare you to death! This is our country's monetary base! It is very clear we are attempting to print our way out of debt. This is being done by adding massive amounts of money backed by nothing but the full faith and credit of a bankrupt government to the system. Never before in the history of our country or in the history of the Federal Reserve have we done anything like this. Reiterating a phrase I used in an article written in 2008 warning of a stock collapse in January 2008, there is a "Lag Between Cause and Effect". The effects of what we have done here will be staggering to the buying power of our currency over the coming years and of course our cost of living. Gold has historically moved inversely, so saving in gold makes far more sense today than saving in bonds, CDs, stocks or dollars. The growth of money indicates that this growth will accelerate in the coming years. Don't wait for public panic, be the one who is prepared. 1.23.13 – During President Barack Obama's first term, the government massively expanded the welfare state, took over American healthcare, effectively expropriated several major banks and two of the nation's three biggest car companies, and nationalized 90 percent of a trillion dollars of student loans. In President Obama's second term, his biggest takeover target is the $18.5 Trillion that Americans have saved in their personal Individual Retirement Accounts (IRAs), 401(K) plans and pension accounts, say two prominent economic experts. “This is one of the biggest pools of private money left in America, and our spendaholic politicians would love to divvy it up,” says Craig R. Smith, a renowned monetary expert whose just-published latest book is The Great Debasement: The 100-Year Dying of the Dollar and How to Get America's Money Back. “In 2010 President Obama's Treasury and Labor Departments, as well as ruling Congressional Democrats, were openly discussing ways, for example, to confiscate private retirement accounts and 'replace' them with a government 'annuity' backed by Treasury bonds,” says Smith. “In effect, this Ponzi scheme would seize peoples' private savings, which politicians would then spend immediately to expand the welfare state, making more voters dependent on government handouts,” says Smith. “Retirees, in place of their savings, would be paid a government bond interest rate lower than the rate of inflation,” says Smith, an expert on money who is frequently interviewed by Fox's Neil Cavuto and other business journalists. “This confiscation of trillions of dollars from the savings of retirees would already be happening if voters in 2010 had not thrown out the Democratic majority in the House of Representatives,” says Smith's co-author Lowell Ponte, a former think tank futurist and retired Roving Editor at Reader's Digest. “Argentina in 2008 effectively expropriated the money in private pension funds, leaving debased government bonds worth only 29 cents of their face value in their place – much as our politicians looted and spent $2.66 Trillion from the Social Security Trust Fund, leaving paper I.O.U. 's in its place,” says Ponte. “In 2010 Hungary demanded that citizens give the government their private savings or forfeit all state pension money they had been promised,” says Ponte. “People need to wake up and see the bullseye, the red laser dot, where rapacious, money-hungry politicians are aiming for their IRAs, 401(K)s, and pensions,” says Craig Smith. 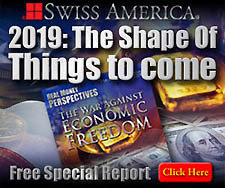 “Take at least a portion of your savings and convert it into something that will not be lost if the politicians suddenly confiscate your retirement accounts, or further debase the dollar's value to cover the stratospheric debts caused by out-of-control government spending,” says Smith. Friends, I’ve been watching the buying power of dollar decline for over forty years now and that’s proof enough for me… everyone needs some wealth insurance, just as we need life, health, home and auto insurance. 2013 brings back memories of 1979 all over again. A potential oil crisis, sky-high gas, food, and gold prices too, but gold is trustworthy. I call it private “wealth insurance”… because gold protects your wealth and privacy, even if the cost of living spins out-of-control! Gold is the best wealth insurance policy on earth! And you can trust Swiss America. I do, and have for nearly two decades now. The Boone family has a lot to be thankful for. Oh sure, at times, our core values have been shaken and tested, but… they've never failed us! I have peace of mind knowing my family will be able to face an uncertain future with certainty and real hope - with real money. - Gold! Our economic future has never been more uncertain, yet, as I plan ahead for my grand children, and great-grand children, I am certain of one thing: my decision to leave them a Golden legacy is right on the money! I can remember a time when a cup of coffee was just five cents, yet today we can pay five dollars or more for the same cup of coffee! I also remember when twenty dollars could buy an ounce of Gold. Today it’s approaching 100 times more dollars for the same ounce of Gold! Some say gold is an ancient relic, too old fashioned to be money anymore – well guess what? Now it's paper money that’s seen better days. Please don't put your family or future in jeopardy. Convert your paper into Gold. Call the professionals, my friends at Swiss America, for your children and grand children’s sake! In January 2013, a series of three new television commercials debuted on CBN's "700 Club" program featuring a new Swiss American spokesperson - Braida Zoe - a smart nine-year old girl who explains The Simple Truth about the dollar, money and the rising cost of living. It seems the more confusing that the political and economic landscape becomes, the more Americans yearn for the simple truth - from someone they feel is honest and trustworthy. Also debuting in February are a series of one-minute radio interviews with Braida Zoe by national talk show hosts including; The Michael Savage Show, The Roger Hedgecock Show and The Pat Boone Show. We believe audiences will find these radio spots refreshing, entertaining and educational. “You're never too young (or old) to learn the value of a dollar,” says Braida. And rightly so. Today, the younger you are the more you have to fear from the fallout of a falling U.S. dollar. The rising cost of basics like; food, education, and health care are just the tip of an economic iceberg. Below the surface lies the startling evidence that our U.S. national currency has lost over 98% of its buying power over the last four generations! It is a sad reality that today's children now enjoying their "wonder years" of innocence will become tomorrow's victims of government spending run amok, including a much lower standard of living for many. Our hope is that this new message will encourage parents to learn more about the true state of the economy so they can take tangible steps of preparation now for their children's future. Swiss America is dedicated to simplifying the truth about how to protect your hard-earned assets with hard-owned assets. Now is the time to leave a golden legacy to our children and grandchildren. Visit www.simplifiedtruth.com for more information.